This principle includes scheduling your trip to avoid times of high use, visiting only in small groups, and packaging food and beverages to minimize potential waste. 2Travel and camp on durable surfaces. Choose ready-made campsites, don’t alter a site to suit your purposes, and stick to existing trails. Walk in single file, and avoid places where you can see that use is starting to damage the area. If you bring it with you, take it away again. For washing and cleaning, use biodegradable products. Don’t take any rocks, plants, or other potentially valuable artifacts with you when you leave an area. This includes any wildlife items such as birds’ eggs and nests. 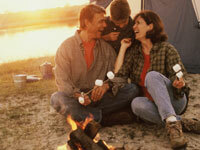 5Minimize the damage of campfires. 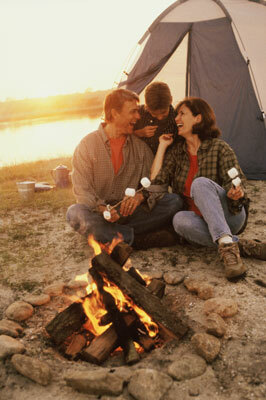 Light a campfire only if permitted by rangers or wildlife officials, and try to use established fire pits when you do. Never leave a campfire unattended, and burn everything to ash to be safe. Feeding animals or other wildlife can alter their natural behavior, so just view them from a distance. Know what to do to reduce your chance of encounters with potentially dangerous wildlife, such as bears, and what to do if you come across them. Respect and give way to other people you encounter on a trail. If your trip includes wildlife watching, ask about the operator’s Code of Conduct before you book. At minimum, it should include provisos to never chase or interfere with wildlife in any way and to limit the time spent watching any one animal.